Mansa Districts Lawyers are on Strike since saturday, 25.05.2013, when a false case was registered against a senior Advocate Sh.Gurdial Singh Gill from Sardulgarh for allegedly outraging the modesty of a woman on boarding a bus a few days ago. Lawyers from Sardulgarh and Budhlada court reached the District courts to strengthen the protest. The Lawyers have demanded that if police did not took the false registered case back, they would be forced to aggravate the protest. Today the Lawyers got together at the District court complex, Mansa and there after went till the SSP office, showing their protest. President of the Mansa Bar Association, Gurpreet Singh Sidhu said that, if the justice is not delivered they would call for strike in whole Punjab. There has been nothing on record from Police as of now. 28..5.2013 : The Lawyers of Mansa, Sardulgarh and Budhlada Bars would protest staying at their respective Bars and would protest there. 29.05.2013: All Lawyers would get together at Mansa for protest. 30.05.2013: Lawyers to protest at their respective bars. 31.05.2013: All Lawyers to together at Mansa for protest against SSP, Mansa and SHO Jhunir. 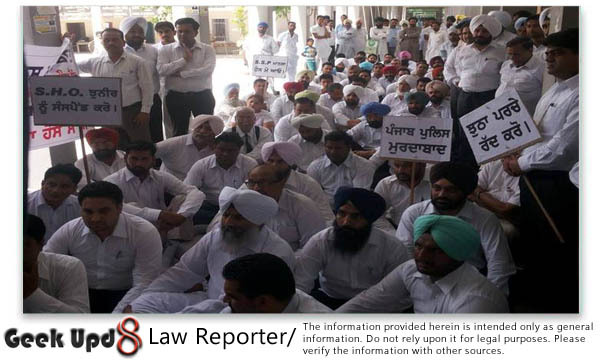 28.05.2013 : All the bar associations across Punjab have gone on strike, supporting the Mansa bar association. Various News agencies like The Tribune covered the issue. 29.05.2013 : The members have decided to boycott from bar council elections in case justice is not delivered. 30.05.2013 : A group of lawyers from Mansa, Budhlada and Sardulgarh went to High Court with a demand of Inspecting Judge. 31.05.2013 : The demands of Lawyers were accepted partly. The FIR has been cancelled and enquiry orders has been given for SHO Jhunir. Lawyers have ended the strike. Please do share this news article with fellow lawyers to show the strength of unity.